Tricomin doesn’t state it can actually prevent or decrease the rate of hair loss brought on by male-pattern baldness. Its function is to actually help to thicken the appearance of remaining hair. Intended for both males and females, Follicle Therapy Spray is a potent treatment + conditioner. It deeply energizes the scalp and delivers necessary nutrient elements to control hair loss and provide the optimum conditions for healthy hair growth. Tricomin products are fortified with the clinically-tested Triamino Copper Complex, a patent peptide blend of copper and amino acids – essential elements to nourish follicles and stimulate the entire scalp for cell renewal. Hair Therapy Is thinning hair a continuing cause of worry for you Then this Tricomin Follicle Therapy Spray is just what you need. The treatment spray is an advanced treatment for thinning hair and is suitable for both men and women. It acts as a leave-in conditioner and is formulated with Triamino Copper Nutritional Complex, which encourages healthy hair growth at the follicle. Triamino Copper Nutritional Complex Contains essential amino acids Encourages healthy growth. 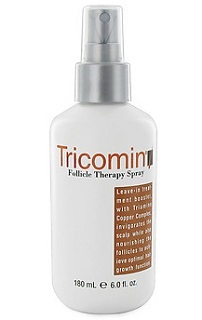 The Tricomin Follicle Therapy Spray helps protect hair from damage caused by the pollution. It is perfect for daily use by both men and women suffering from thinning hair. Ingredient: Copper Peptide, Alpha Hydroxy Acids, Panthenol.